Discover how to create a happy and healthy home for your pet bird with our buying guides, step-by-step building tutorials, best product reviews and more! The Peach-Faced Lovebird is a small parrot that is one of the most widely kept pet birds. They are lovable and courageous little birds that are very devoted to the human or other bird with which they bond. Social and playful, they are a great choice for those wanting a parrot with a large personality that’s kept in a small, more easily managed bird. 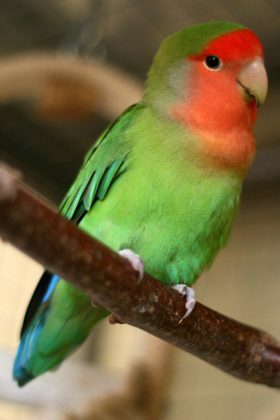 The scientific name of the Peach-Faced Lovebird is Agapornis roseicollis and according to parrots.org, there is only one subspecies. They are companion parrots that measure 6 inches (15 cm) in length and weigh between 1.6 and 2.2 ounces (46-63 grams). These birds are also known as Rosy-faced Lovebirds, Rosy-headed Lovebirds, and Rose-ringed Lovebirds. Named for the pink feathers on their face and upper breast, they also have some blue on their lower back. The rest of their body is primarily green. More reddish cheeks are what distinguish the single subspecies catumbella. Selective breeding has been responsible for many variations, introducing blue and yellow to their original colors. 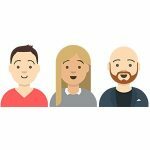 There are no physical differences between males and females, so DNA testing is recommended if you want to know their gender. 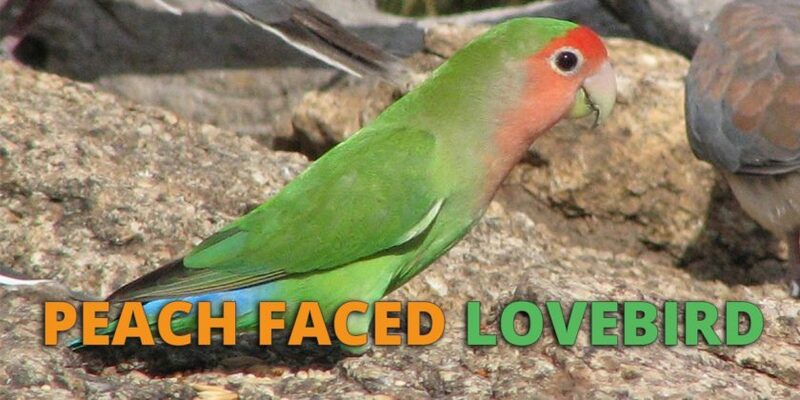 Peach-Faces are native to southern Africa and feral lovebirds are now prevalent in Arizona in the United States. This colony started from some escaped birds and the population is thriving. They favor locations that are near water and are found in diverse landscapes such as arid woodlands and dry mountainous areas up to an altitude of 1500 meters (4920 feet). In the wild, their diet consists of seeds, mainly grass, sunflower seeds, and millet. What Do Peach-Faced Lovebirds Look And Sound Like? One of the reasons for the Peach-Faced Lovebirds being so popular is their beautiful coloration. They are very pretty birds and their rosy cheeks can make them seem clown-like as they play and interact with humans and other birds or pets. They have a rather shrill call that they make in single notes or repetitions. The speed of these repetitions increases when the bird is excited or alarmed. Peach-Faces chatter a lot and they can be loud when they want to be, so may not be appropriate in all situations. It is rare that a lovebird will mimic human voices, though if training is attempted at a very young age they may learn a few words. Here is a video demonstrating their appearance and voices. What Behavior Can I Expect From My Peach-Faced Lovebird? These parrots are very active birds who spend their day in almost constant motion. They love to play and need plenty of toys to keep them occupied in their cages. Peach-Faces are very friendly birds, according to pethelpful.com and love to be around people. Their antics make them very entertaining to watch. They can have a propensity for biting and do have a tendency to chirp all day long. Due to the biting issue, they are not the best birds for families with small children. If you want a bird that is quiet, this is definitely not the right choice for you. Another aspect of this parrot’s behavior is the strong bond they form with whoever they consider their mate. This may be another lovebird or a human companion. Jealously toward others may become an issue. They can become depressed after the loss of a mate. Socialization with multiple humans can minimize the problem, but they can become one-person birds. Peach-Faced Lovebirds require daily interaction with their chosen mates to maintain their mental well-being. They should be given ample room to fly to maintain their physical health. Lack of proper mental and physical stimulation can cause your parrot to resort to feather plucking. These parrots can be kept singly if they are given the proper attention and will bond quite readily to a friendly and attentive human. You can also keep multiple lovebirds, but they can be aggressive at times, so it is advised if you keep more than one in a single cage that it is roomy with plenty of space between the perches. It is best to have only one pair per cage and they do not do well with birds of other species. You need to watch your lovebird around other family pets, as these birds can be fearless and will go after anything that they feel is threatening its dominance. This is another factor against having these birds with children. Lovebirds are intelligent and can be taught many tricks. They are not good talkers but make up for this by exhibiting intelligence in other areas. Cages with doors that slide up and down are child’s play for these birds and once they figure this out, the only way to keep them in their cages is with a lock. Daily interaction is required to tame these birds and after prolonged periods of inattention, it may take some time to reestablish your relationship with your parrot. How Do I Care For A Peach-Faced Lovebird? Cage size for a single lovebird should be no less than 24x24x24 inches with bar spacing of 1/2 inch. Best kept at temperatures of 65-80 degrees Fahrenheit, they are sensitive to sudden temperature changes. Lovebirds love to bathe and should be given the opportunity frequently. Their nails may need to be clipped about every three months. They molt twice a year, most often in the fall and spring. These birds need a lot of exercise and interaction to maintain their health. Multiple toys in a spacious cage will help them keep busy and they should have some natural wood perches to exercise their feet. Their diet should be based on a high-quality pellet, although some lovebirds will not take to this if it is not introduced when they are very young. Fortified seed can be used as an alternate and in either case, they should get regular helpings of fresh fruit and vegetables. It is legal and relatively easy to breed lovebirds. Females will often lay eggs even in the absence of a male. According to parrotfeather.com, they can be bred year round, but very hot weather should be avoided as it is dangerous to the chicks. The female will lay 2 to 6 small white eggs and can produce up to four clutches per year. Here is a video of some baby lovebirds. How Healthy Are Peach-Faced Lovebirds? The average lifespan for these parrots is 15 years and some have lived close to 25 years in captivity. Some common health problems associated with lovebirds are respiratory problems, Vitamin D and calcium deficiency, polyoma, chronic egg-laying and feather plucking. Diet, exercise and interaction can minimize these issues. Females can also become egg-bound as a side-effect of chronic egg laying. What is the price of a Peach-Faced Lovebird? These small parrots can be found on average from $50 to $150 dollars, with the rarer color mutations commanding the higher prices up to $200. They do not require very large cages and are not terribly destructive to their toys. Their size results in a smaller food bill than some other parrots. All told, they are relatively inexpensive to buy and maintain when compared to other parrots. Should I Get A Peach-Faced Lovebird? These birds are great for those who want a small, cuddly parrot. If you can tolerate the constant chatter and are prepared to give it plenty of interaction then this bird will become a well-loved, avian family member. Original images sources available here and here. Just bought one named it Khalil… ! Your bird sounds sick and should be taken to the vet for a proper examination. In the meantime, check out our guide on parrot diseases here. How Much Do Parrots Cost? As an Amazon Associate Herebird.com earns from qualifying purchases. HereBird.com is a participant in the Amazon Services LLC Associates Program, an affiliate advertising program designed to provide a means for us to earn fees by linking to Amazon.com and affiliated sites. Amazon and the Amazon logo are trademarks of Amazon.com, Inc. or its affiliates. HereBird.com is also involved in various other affiliate programs, so when someone buys a product on a site we link to, we may receive a commission.